Good quality, fast delivery and quick response! I'm very satisfied. I am very happy about the screw bolts, the quality is very good, thanks for your effort. Looking for more business with you. 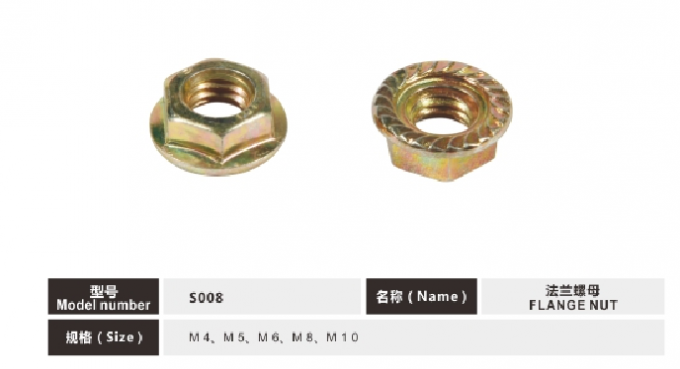 A flange nut is a nut that has a wide flange at one end that acts as an integrated, non-spinning washer. This serves to distribute the pressure of the nut over the part being secured, reducing the chance of damage to the part and making it less likely to loosen as a result of an uneven fastening surface. The flange may be serrated to provide a locking action. The serrations are angled such that they keep the nut from rotating in the direction that would loosen the nut. Because of the serrations they cannot be used with a washer or on surfaces that cannot be scratched. The serrations help in avoiding vibration of nut and increase the holding power of nut. 3) We work with customers to develop new product lines and new toolings. 4) We have solid packaging design experience. 8) Our experienced staff is adept in maximizing storage and shipping space to minimize shipping costs. China Good Quality Furniture Screw Bolts Supplier. Copyright © 2018 - 2019 furniturescrewbolts.com. All Rights Reserved.